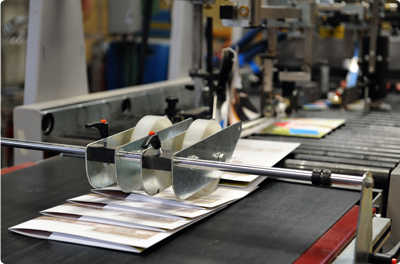 Sipe Steel Rule Die, Inc., offers fold and glue services to complement our foil stamping and embossing services, giving you a single source for production of custom folders, 3-panel pamphlets, and cartons. Our folding and gluing equipment transforms a piece of flat material into a finished product such as a box, envelope, or promotional item. We can create horizontal, vertical, or rounded pocket folders of various capacities and expansion options. Capable of processing presentation folders measuring up to 30" x 30", our fold and glue services are also great for CD covers, 9" x 12" folders, and 9" x 13" mailers. We offer a wide variety of adhesive choices, including double sided tape, peel strip tape, as well as hot and cold glues. In addition, we will recommend the best option based on the properties of the material and its intended use. Tri-fold pamphlets, such as those found in CDs, are processed rapidly and with precision. Whether it's a small scale production run or large order with a million pieces, we take a great deal of care to make sure your project is perfect. We are highly automated, accommodate lead times of less than 72 hours, and offer very competitive pricing. Contact us today to learn more.